NEW: OpenWire Editor is now included as part of the Firemonkey - VCL or .NET component packages! Also, we offer custom licensing of the OpenWire Editor. Embed a custom version in your product and offer users the simplicity of making graphical connections (see the video, below) to configure and control your application! Please direct any questions about custom licensing of the OpenWire Editor to Boian Mitov ( mitov@mitov.com ). 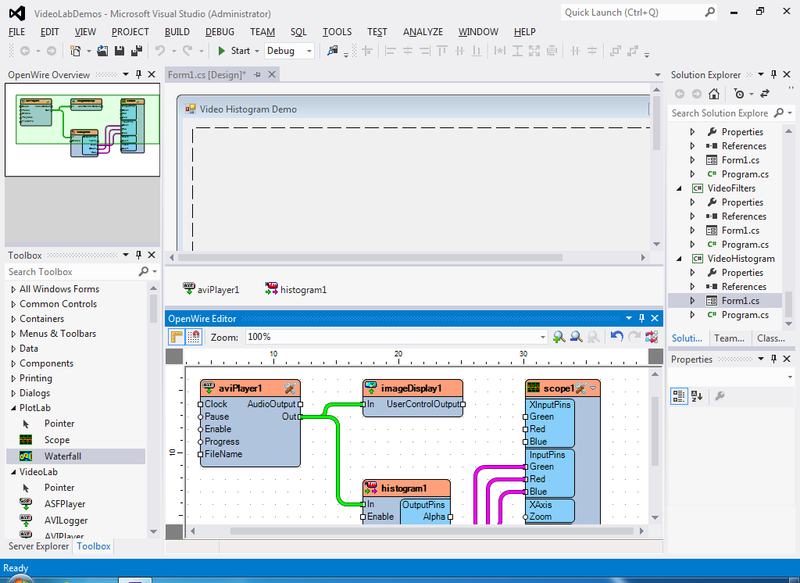 The OpenWire Editor provides an intuitive, powerful graphical editing pane to build OpenWire applications simply by connecting components (FireMonkey, VCL, .NET) and making wiring diagrams. In the OpenWire Editor, the "wires" are like those connecting a TV to a VCR, or speakers to a surround system; the OpenWire pins are analogous to the jacks where you plug the wires in; and the OpenWire components correspond to the entertainment components (TV, speakers, etc.). The purpose of the OpenWire platform is to provide a unified, easy way to transfer data among different software components. 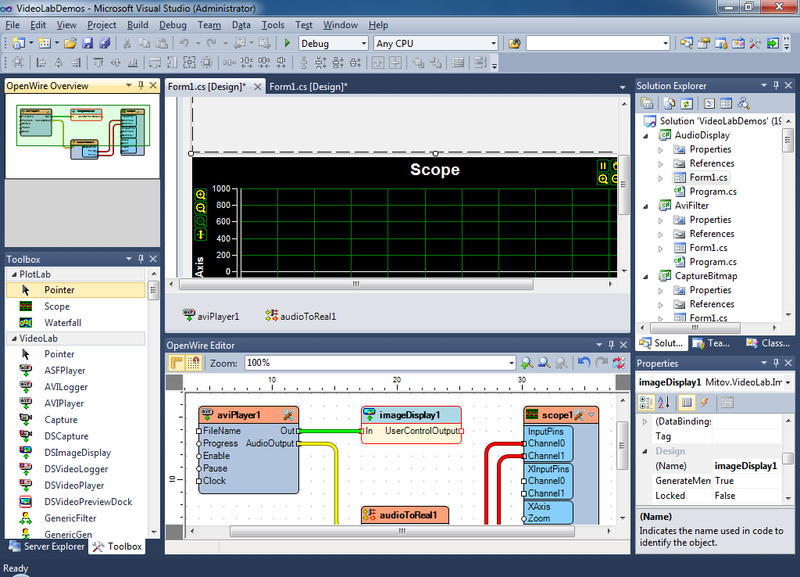 For example, the platform is designed so that you could quickly build an application with a sine wave generator, which streams out to a chart and in parallel to a filter, which streams out to another chart and in parallel to a file logger, as well as to a serial communication sending the data to another system. And what makes this easy is that you do not write code: You build streams by connecting an OutputPin to one or more InputPins. The OpenWire Editor further simplifies this pin connecting by allowing you to see the big picture as you connect components. Mitov Software offers a vast array of custom componets on multiple platforms; or, you can build your own. Then, when you run your application, the unerlying OpenWire technology pumps your data from pin to pin, using multiple threads for high performance. - See the big picture of data flow throughout your application. 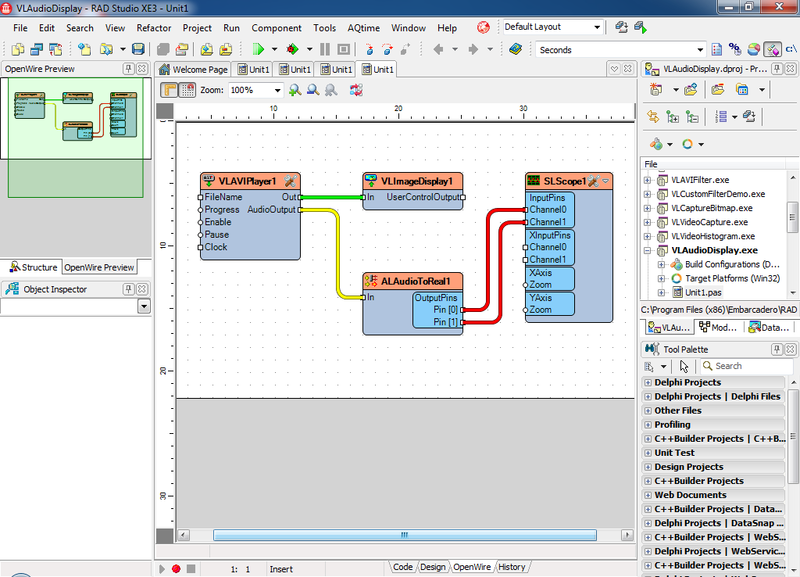 While working in RAD Studio, the (Form) Design tab allows you to design your GUI, and the OpenWire tab lets you design and visualize the data stream paths. - Round-trip synchronization of the Form Design tab and the OpenWire Editor. Any components added or removed, and any pins connected or disconnect are reflected in both views. - Edit component properties without leaving the OpenWire tab. The "tools" icon in the upper-right corner of each component gives you access to the major properties of that component. - Simplified control of data flow. For example, the OpenWire pins carry not only data but transfer events, such as start, stop, and pause to other components in the stream. - Simplified control of stream state. Connected StatePins share one and the same state. If a the state of one of the StatePins changes all the connected StatePins are changing to the same state. StatePins can be connected to one SourcePin, and/or to multiple SinkPins. - Simplified control of clock timing. ClockPins allow the data flow to be driven by an external clock. For example, if you need to process a batch of video files then you can use an external clock to drive the video stream as fast as the underlying threads will allow. Each component can have one or more inputs (data sinks) and/or outputs (data sources). Each type of data has its own data specification, and it is this specification that allows compatible pins to be connected in the OpenWire Editor. To learn more about OpenWire pins and communication between pins, see the Features of the OpenWire open source technology. First Official Release of OpenWire Editor -- beta. This is a Pre-repeals technology preview of the OpenWire Editor.